My dream had become reality. Weighing 20 pounds (half the weight of my previous bicycle) with 45% more gear range, and a much lower profile, this was like a rocket after lugging around my rusted Schwinn for five years. It also cost me $850 (compared to $140 for my Schwinn.... performance isn't cheap). I wanted a fast, durable bicycle, well suited for long distances, and although I wanted red, I got such a great deal on this aluminum Klein, I figured color wasn't important. Everything was put together with performance and durability in mind. The wheels, although using aerodynamic rims, were severely over-built, with 36 spokes, front and rear, weighing 2168 grams a pair (about a pound more than todays average racing wheel). I only weighed 140 pounds. My co-workers gave me a hard time about the bright pink handlebar tape. I wasn't coming out of the closet or making a statement of homosexual solidarity - I just thought it went well with the silver frame. After getting harrassed for a while, I bought a pink waterbottle and a pink racing jersey and for a while wore women's shorts. The first time Bill and I went riding, I tried very hard to impress him. He'd been riding 'good' bicycles for years (I hadn't ridden in 15 months) and knew volumes about cycling compared to my zero. If it wasn't for Bill I wouldn't have gotten off to such a great start. He even gave me his saddle, pedals, and tool bag. This basic setup went unchanged for many years. 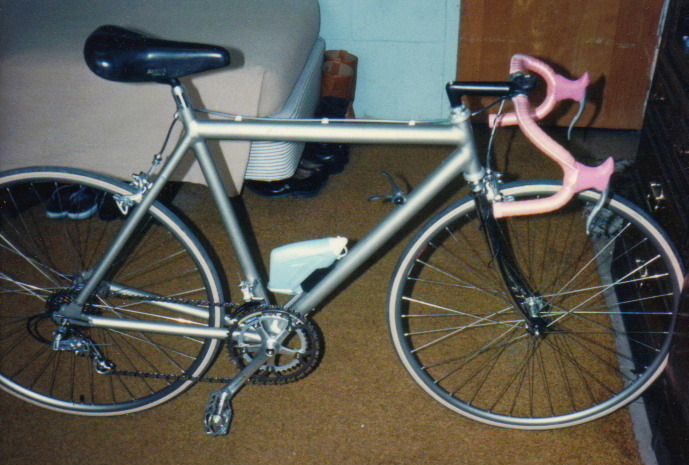 I had spent so much time trying to plan this bicycle, and had so much success on my early riding with it, I figured my secret was the bicycle. After about three years I changed out some components and found I was faster. So - it wasn't the bike, it was me.